Spectrum-Mobile Friendly Blogger Template has a very good design with vibrant colors in the beautiful Iris style. 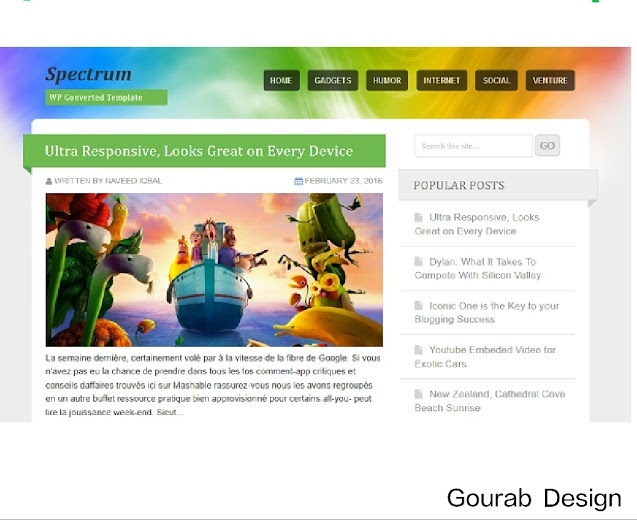 Spectrum theme was first designed by WP for WP Blog. I personally like the combination of grace and color of this . I am sure should be a lot in search. With some precise background color tabs, all the headings are highlighted in a great way. The spectrum is a perfect SEO optimized ,I'm telling you that the font is like the font style and size.Spectrum blogger template free download and Leave your feedback on the comments below. Spectrum Free Template For Blogger 2018 has a vibrant color in a beautiful Eastern style. It was organized for the first WordPress blog, but now it comes new and stylish and the most interesting thing is that it is now available for blogs and comes stylish appearance. You can download and use this Free Premium Blogger Template Seo Friendly theme on your favorite blog. It has a responsive, easy, SEO friendly and super fast loading design. This is one of the best and most ideal themes for writing blogging, magazines, personal, social, gadgets and stories.